No white marks. 48 hour clinical performance without the white marks. Clinical performance against odour and wetness. Specially formulated to combat heavy perspiration. Goes on clear. Fragrance that last for 24 hours. Dries quickly. 3 slot applicator. 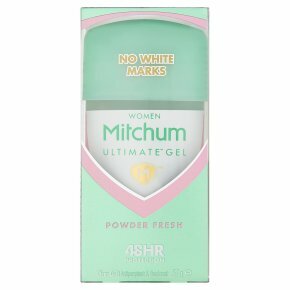 Dermatologist tested.Who should use Mitchum Ultimate\ Gel? Women looking for a Clinical Performance\ formula, for protection against odour and wetness, without the white marks. Instructions: On first use, turn clockwise until product dispenses. For maximum protection, apply Mitchum Ultimate Gel to underarms before going to bed. While you sleep, our formula works to provide long-lasting protection that will last throughout the next day, even after showering. Can also be applied in the morning. Directions: To dispense turn clockwise until product appears. Apply to underarms only. Caution: For external use only. Do not use on broken skin. Stop use if rashor irritation occurs. Ask a doctor before use if you have kidney disease. Keep out of reach of children. If swallowed, get medical help or contact a poison control center right away.